Trump's claims about falling black unemployment aren't the full story. Ahead of the midterm elections, ABC News is highlighting key issues that affect Americans and how the Trump administration's policies are making a difference in their lives. This part of the series focuses on whether commonly quoted statistics paint a full picture of joblessness and prosperity in the U.S.
Donald Trump likes to boast that unemployment, specifically unemployment for black Americans, is at an all-time low. "Unemployment for Black Americans is the lowest ever recorded. Trump approval ratings with Black Americans has doubled. Thank you, and it will get even (much) better!" he tweeted in January. Black unemployment, like overall unemployment, is, in fact, at record lows. The U.S. unemployment rate fell to 3.7 percent in September, according to the Bureau of Labor Statistics. Since January, the unemployment rate has fallen nearly half a percentage point overall. But the unemployment rate doesn't necessarily tell the entire story, experts told ABC News. Delving into the numbers, the racial disparities become clear. While the outlook's improved for everyone, it especially improved for whites. Unemployment among white workers slid to 3.3 percent. For minorities, however, the numbers showed little to no change from the previous month. For black workers, unemployment hovered at 6 percent, while it's 3.5 percent for Asians and 4.5 percent for Hispanics. "It's true [black unemployment] has been declining, but it's still much higher than other groups," Valerie Wilson, the director of the Economic Policy Institute's Program on Race, Ethnicity and the Economy, told ABC News. "It's the persistence of the racial gap. To me, that's the bigger challenge." 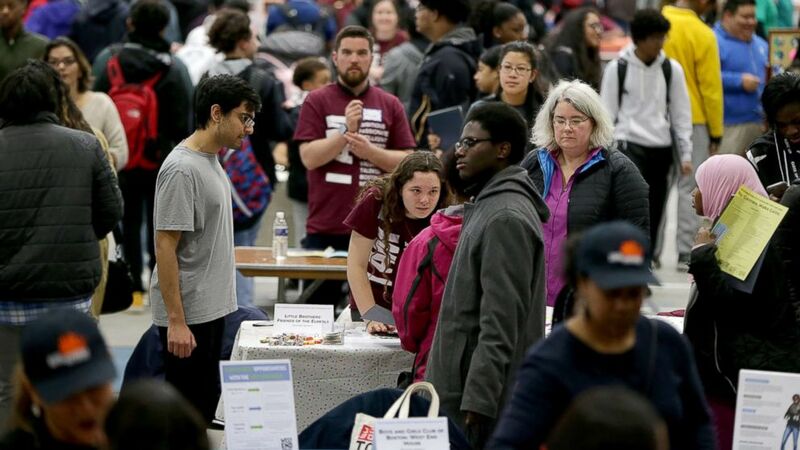 (Boston Globe via Getty Images) People attend a youth job and resource fair at the Reggie Lewis Track and Athletic Center in the Roxbury neighborhood of Boston, March 10, 2018. In other words, black unemployment remains the highest -- nearly double that of whites. "There's nowhere you'd go in the country and see the black and white unemployment rate as the same -- it's race, any way you slice it," Wilson added. Economists point to systemic biases in hiring and firing that put blacks at a disadvantage. But there's also the way unemployment numbers are collected and interpreted -- the rate is based on the number of unemployment claims made. Most of those who are unemployed long term, work part time, are a contractor or consultant or have a job in the gig economy -- like an Uber or Lyft driver -- aren't eligible for benefits. In other words, potential workers no longer eligible to file unemployment claims, as well as people who weren't laid off from the right kind of full-time job, are not included in federal unemployment figures. 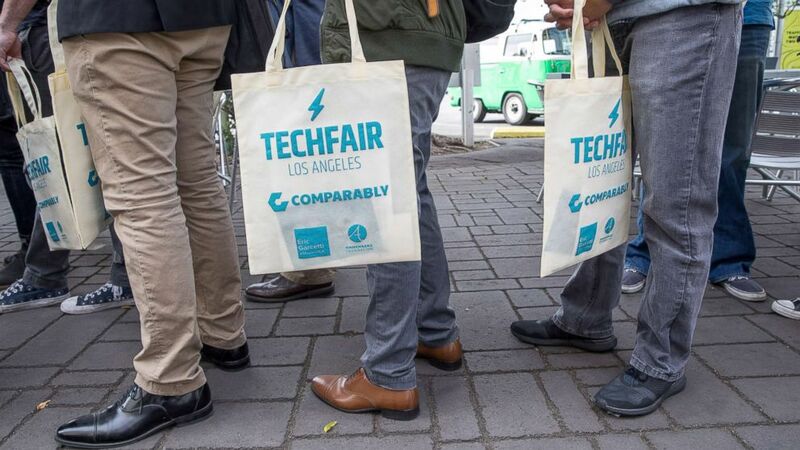 (Monica Almeida/Reuters) Job seekers line up at TechFair in Los Angeles, March 8, 2018. Then there's the way the overall definition of work has evolved over the past century, ever since the government started collecting unemployment data in the 1940s. "Jobs today are less secure, and real wages are still very low," said Darrick Hamilton, a professor of economics and urban policy at the New School in New York City. "Considering jobs today in a historic sense is not quite apples to apples, given the nature of employment in terms of low wages, and high volatility between when and how long you work from week to week, and the vulnerability to job layoffs that comes with contingent work." Another racial gap persists in accrued wealth. "Currently, the median black household has about 10 percent of the wealth of the median white household," Wilson said. And of course, there is mass incarceration. The imprisoned population in the U.S. has increased more than tenfold since 1972 to more than 2.2 million, according to the Equal Justice Initiative. Incarcerated people are not counted in unemployment figures. If they were to be, the unemployed numbers would jump, particularly for blacks, economists said. In 2016, blacks represented 12 percent of the U.S. adult population, but 33 percent of the sentenced prison population. In contrast, whites accounted for 64 percent of adults in the U.S. but 30 percent of prisoners, according to the Pew Research Center. "The base by which we calculate unemployment for black men is skewed," Hamilton said, "because a relatively larger segment of the black population is incarcerated and excluded from the unemployment calculus altogether."